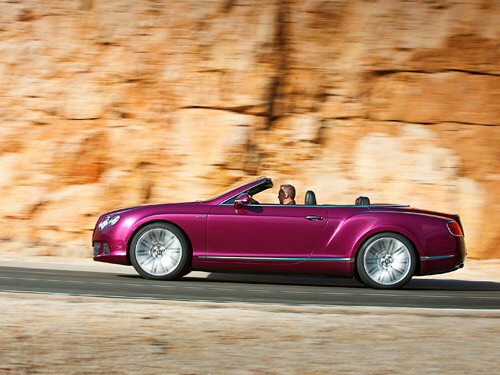 The Continental GT Speed Convertible, Bentley’s new open-top performance flagship - and the world’s fastest four-seat convertible - makes its motor show this month at the Detroit Motor Show, in the USA. 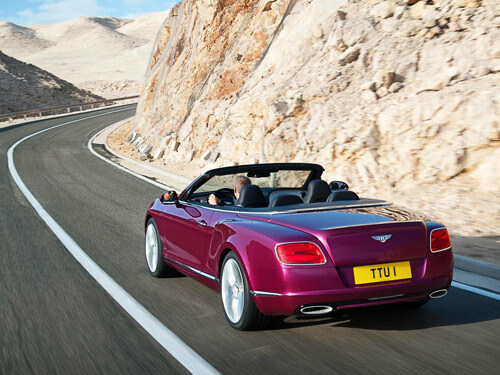 The new GT Speed Convertible combines the sensory pleasures of roof-down luxury touring with the shattering performance of a 625 PS (616 bhp) twin-turbocharged 6.0 litre W12, while delivering a fifteen per cent improvement in fuel efficiency. The close-ratio eight-speed transmission, uprated and lowered suspension and retuned steering provide exhilarating acceleration and sharp, communicative handling without detriment to the renowned ride comfort of Bentley’s Continental convertible. Permanent all-wheel drive ensures optimum traction and power delivery regardless of the road conditions. Taking its place at the pinnacle of the Bentley Continental range, the new GT Speed Convertible has a top speed of 202 mph (325 km/h) and in the traditional Bentley manner, no compromises have been made in craftsmanship, luxury or refinement to deliver this unrivalled performance. 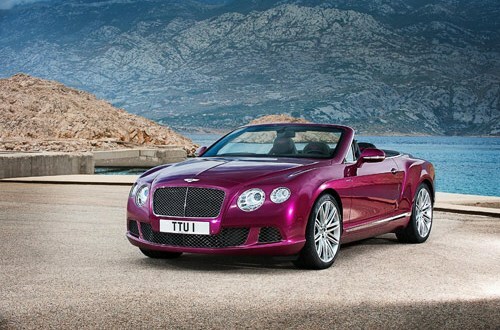 The new Continental GT Speed convertible shares its powertrain specification with its Bentley stable mate the GT Speed coupé. The 625 PS (616 bhp) twin-turbocharged, 48-valve, W12 engine powers the new convertible to 60 mph in 4.1 seconds (0-100 km/h in 4.4 seconds) and onto a top speed of 202 mph (325 km/h). Nought to 100 mph (160 km/h approx.) is despatched in only 9.7 seconds. Peak torque – an impressive 800 Nm (590 lb.ft) – is reached at just 2,000 revs/min and maintains that level through to 5,000 revs/min for effortless, refined performance at all times. 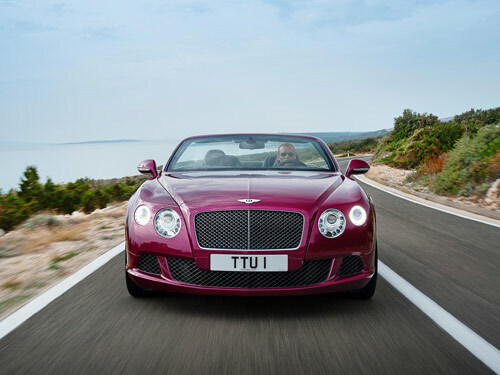 The new GT Speed Convertible’s powertrain is even more tractable than its Speed predecessor, and just as fuel-efficient as the new W12 Continental GT. Switching the gear selector to ‘Sport’ mode however demonstrates the dual personality of the new GT Speed convertible, delivering a sharper throttle response, gear-shifting at higher engine speeds and faster ‘block shifting’ (eg 8th direct to 4th gear) for instantly accessible acceleration. The enhanced performance is accentuated by a glorious "baritone snarl" (Bentley's words) from the free-breathing exhaust, a thrilling soundtrack to the magnificent powerhouse under the bonnet. With torsional stiffness a class-leading 22,500 Nm/degree, the body shell of the Continental GT Speed convertible is exceptionally rigid, laying the perfect foundation for a more engaging driving experience. The aluminium double-wishbone front suspension and trapezoidal multi-link rear set-up feature revised air suspension springs and dampers for improved agility and body control with little sacrifice in ride comfort. The front mudguards of the GT Speed Convertible are made in superformed aluminium, their seamless form and crisply-defined body creases make an impression of tension and 'muscularity'. The 10 mm lower suspension and unique 21” wheels accentuate the wide, low and poised stance. Despite the super car performance, additional spoilers are unnecessary – the gentle lip on the double-horseshoe boot lid generates all the downforce the GT Speed Convertible needs, even at over 325 km/h (200 mph) on a race track. Flat panel Balanced Mode Radiator (BMR) speakers, which combine the functions of separate tweeter and mid-range speakers in one unit, direct the sound with accuracy and provide greater clarity across the audible spectrum. Alternatively, the audiophile Naim for Bentley system, incorporating custom-built speakers and eight individual Digital Sound Processing modes, is available as an option. As a thoughtful touch, the audio balance settings automatically alter when the roof is lowered to compensate for the change in listening environment. 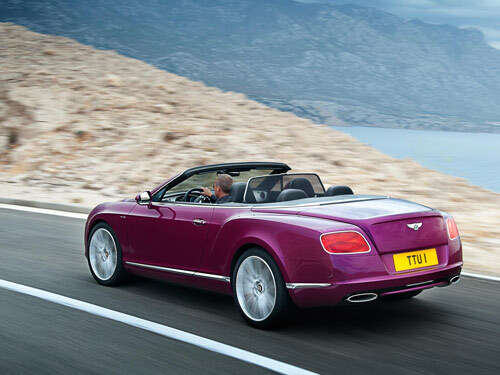 The new Bentley Continental GT Speed Convertible provides the luxury and refinement of a coupé yet transforms into a head-turning open tourer at the touch of a button. The four-layer hood ensures high levels of refinement and acoustic insulation. Exhaustively tested in all conditions from -30°C to +50°C or more, it resists even monsoon-force rain and maintains comfortable, draft-free warmth even on the coldest days. Another practical feature, the neck warmer, makes open air driving an appealing and comfortable prospect even on the cooler days of spring and autumn. With the hood down, the Continental GT Speed convertible offers sensational performance with the sensory amplification of open-air motoring. 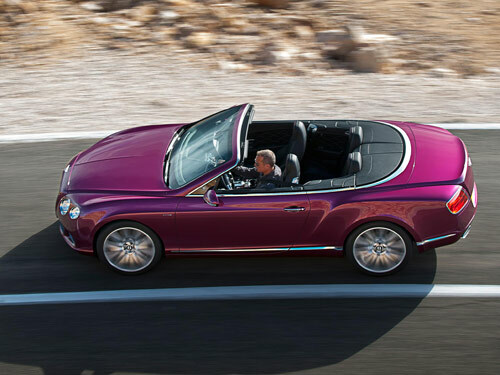 Hood up, it’s as practical a year-round proposition as its coupé stable mate. The result is an exhilarating combination of performance and practicality; a Bentley that can tackle sun-drenched boulevarde or snowy alpine pass with equal aplomb. Although the Speed nomenclature was revived in August 2007 with the first generation Continental GT Speed, the name originates in the W.O. Bentley era, with the 3 Litre Speed of 1925 and the subsequent le Mans-winning Speed Six model. Fittingly, the first-ever Bentley Speed was also an open tourer, giving pioneer motorists the chance to enjoy wind-in-the-hair motoring with genuine 100 mph capability. In contrast, today’s 202 mph GT Speed Convertible is more than twice as fast as its ancestor - and considerably more civilised for driver and passengers. NOTE: ** Fuel consumption figures are provisional and subject to Type Approval and/or EPA certification.